The temperature dipped to a minimum of 5.4-degree Celsius on Saturday, as the cold wave continued to hit the city. Delhi witnessed showers on Sunday morning. Photo Credit: ANI. 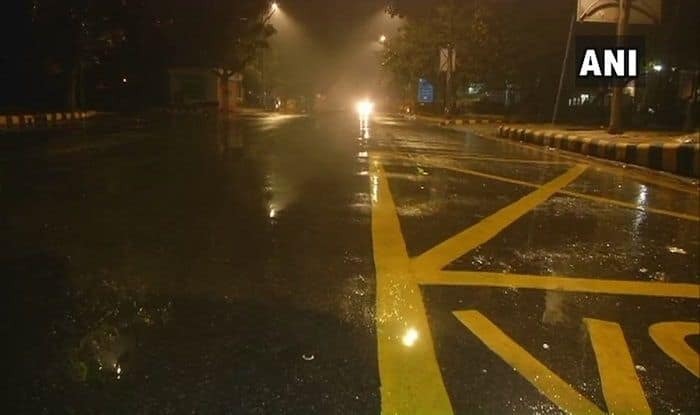 New Delhi: The National Capital area witnessed showers on Sunday morning as predicted by the India Meteorological Department Forecast. The temperature dipped to a minimum of 5.4-degree Celsius on Saturday, as the cold wave continued to hit the city. Visuals of showers in parts of the National Capital region near Press Club of India and Rajpath was tweeted by news agency ANI. The MET department officials predicted moderate fog accompanied by mild showers during the next 24 hours in Delhi. Meanwhile, the air quality index of Delhi lowered to ‘very poor’ category on Saturday after being in the ‘severe’ category. An AQI between 100 and 200 falls under the ‘moderate’ category, the index between 201 and 300 is considered ‘poor’, 301 and 400 is marked as ‘very poor’, while that between 401 and 500 is ‘severe’, as per the Central Pollution Control Board (CPCB) data. As per the CPCB data, 24 areas in Delhi recorded an AQI of ‘severe’ category, while eight areas had ‘very poor’ air quality. In the National Capital Region (NCR), Ghaziabad and Noida recorded ‘severe’ air quality while Gurgaon recorded ‘very poor’ air quality, it said. Delhi’s air quality improved slightly on Friday due to favourable wind speed. However, unfavourable meteorological conditions made it ‘severe’ once again. In view of Delhi’s air quality, the Supreme Court-appointed Environment Pollution Control Authority (EPCA) had ordered a 24-hour ban on the entry of trucks into the national capital from 11 pm on Friday.